The Caldwell Family will be honored with the 12th annual Spirit of Skiing Award by the New England Ski Museum on Saturday November 4, 2017 at the McLane Family Lodge at the Dartmouth Skiway in Lyme Center, New Hampshire. The award is given annually to an individual or group that in the judgment of the ski museum directors personifies the axiom that “skiing is not just a sport, it is a way of life”. This aphorism, first spoken by New England ski pioneer Otto Schniebs, has guided the museum’s board for more than a decade, as ski luminaries including Stein Eriksen, Tom Corcoran, Herbert Schneider, Penny Pitou, and the Cochran Family have received the award. The public is invited to the 40th annual meeting and dinner of the Museum which is capped by presentation of the award. The cost of the dinner is $85 per person. The event opens with a reception from 5:00 to 6:30 PM, followed by a short business meeting and then a family style dinner. 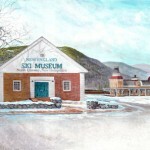 Reservations may be made by calling the museum at 800-639-4181, or at http://www.newenglandskimuseum.com/events. Reservations should be made prior to October 25. All proceeds of the event support the non-profit organization. John Caldwell moved to Putney, Vermont from Pennsylvania with his family as an eighth-grader. He skied on the Putney School ski team, and in one four-event race in which the team needed a cross-country skier, raced on a pair of his sister’s alpine skis. It was only when he skied for Dartmouth that he got any instruction in Nordic technique. Returning to the Putney School as teacher and coach in 1953, he coached the cross-country team through the 1950s and 1960s, when the Putney School cross-country team could beat most college teams. Competitor, coach, author and Nordic skiing innovator, John Caldwell is father and grandfather to the first family of Nordic ski racing. The Caldwell Family will be honored with the New England Ski Museum’s 12th annual Spirit of Skiing Award. 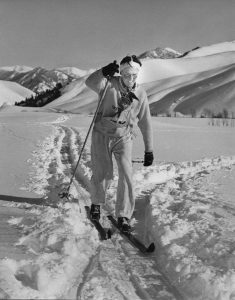 He became an early importer of Jarvinen cross-country skis with the goal of ensuring a reliable supply for secondary school and college racers, but Caldwell found coaching and writing were more to his liking than business. His 1964 book The Cross-Country Ski Book anticipated the expansion of the sport, and served as the bible of cross-country for the thousands of neophytes who took up Nordic at the end of that decade. Caldwell raced in the 1952 Olympics in Oslo, and served as the men’s coach of the US Cross-country Ski Team from 1966 to 1972. He was mentor and theoretician for a generation of U.S. cross-country racers, and it was perhaps not surprising that there was a good deal of overlap between the Putney School and U.S. cross-country ski teams. The award to the Caldwell Family encompasses three generations of Nordic skiers, all of which have been involved with competitive skiing at the highest levels. John and his wife Hep’s children Tim, Peter, Sverre and Jennifer all skied at an early age at their Vermont home. Tim raced for the U.S. team in the four Winter Olympics between 1972 and 1984 and competed in 30 World Cup events. Sverre served as coach for the U.S. Ski Team and for Stratton Mountain School, and Jennifer, now deceased, won the 1983 American Birkebeiner. Grandchildren Patrick and Sophie currently ski for the U.S. Ski Team. Sophie, Sverre’s daughter, was 6th in the Olympic freestyle sprint at Sochi, and Patrick, son of Tim, won the 2015 NCAA 10 km freestyle in Lake Placid. Because some half dozen Caldwells have graduated from Dartmouth, the event will be held at the Dartmouth Skiway’s McLane Family Lodge, with catering by Christophe Chef Services.